"Fanély Revoil was a French singer who had a major career in opera and operetta between 1950 and 1989. In 1933, she made her first appearances in Paris, at the Theatre de la Porte Saint-Martin in small roles before creating Madame Dubarry in the French premiere of LA DUBARRY. Following this success, others followed including Paris premieres of creations in VALSES DE VIENNE (1933), LE TZAREWITCH (1935), UN COUP DE VEINE (1935), AU SOLEIL DU MEXIQUE (1935) and LA BELLE TRAVERSEE (1937). After the Porte Saint Martin she made her debut at the Opéra-Comique (creating the role of Lucine in LE TESTAMENT DE LA TANTE CAROLINE), and although never a member of the company she sang regularly with them for ten years, including Lazuli in L'ETOILE, la Guimard in FRAGONARD and the title role in CIBOULETTE. Revoil appeared many times at the Theatre du Chatelet, in SOLEIL DU MEXIQUE, NINA ROSA, ROSE-MARIE, and created the title role in LA MARÉCHALE SANS-GÊNE there in 1948. At the Theatre des Champs-Elysées she performed in the premiere of VIRGINIE DEJAZET in 1946. She made many foreign tours (Portugal, Netherlands, Italy, Britain) often alongside Willy Clément. After retiring from the stage she taught operetta singing at the Paris Conservatoire. As well as the 1941 recording of excerpts from L'ETOILE under Roger Désormière and the complete 1948 recording of THE TALES OF HOFFMANN under André Cluytens, Revoil sang in many French radio recordings of operettas and opéra-comiques during the 1950s, and appeared in the film LES DEUX GAMINES in 1936." "Following studies at the Paris Conservatory, Michel Sénéchal made his debut in 1950 at La Monnaie in Brussels. Under contract there for three seasons, he sang the lyric tenor repertory, as he continued to do later at both the Paris Opéra and the Opéra-Comique and in other theaters through France. His sophisticated sense of makeup, stage movement, comic timing, and seizing each element of irony and rendering it unforgettable all are built upon the underpinnings of a handsome light tenor voice, well-trained and always pleasant to hear. So dominant has this supporting artist become, the catalog reveals multiple recordings of his core repertory. His roles grew to include Rossini's Almaviva and Comte Ory, Hylas in Berlioz's LES TROYENS, Paolino in Cimarosa's IL MATRIMONIO SEGRETO, Georges Brown in Boieldieu's LA DAME BLANCHE, and three of Mozart's leading tenor parts: Tamino, Ferrando, and Don Ottavio. At Aix-en-Provence in 1956, Sénéchal sang the travesty role of Rameau's PLATEE, a curious creature of heart-stopping homeliness who believes herself to be beautiful. The role is both a leading one and a character study. His success in the role was so great, he was called upon to perform the part in Amsterdam, at the Monnaie, and later, the Opéra-Comique. For Michel Sénéchal's Metropolitan Opera debut on 8 March, 1982, he was engaged for LES CONTES D'HOFFMANN, performing the four comic tenor roles, a turn that by then had all but become a signature assignment. Other roles following at the Metropolitan were Guillot in Massenet's MANON and Mozart's Don Basilio. Sénéchal has, in addition to established repertory stage works, undertaken contemporary operas. Sénéchal's mastery of the tenor character repertory has repeatedly brought him into the recording studio. His four comic characters in Hoffmann have been preserved on disc three times, while in James Levine's recording of ANDREA CHENIER, Michel Sénéchal appears together with his greatly respected Italian counterpart, Piero di Palma, and supporting principals Scotto, Domingo, and Milnes. 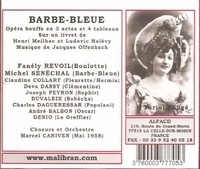 In addition to Offenbach's HOFFMANN and a near-definitive ORPHEE AUX ENFERS recorded under Plasson in 1978, Sénéchal appears with Dame Felicity Lott in a recording of LA BELLE HELENE released in 2000." "Deva-Dassy was a French opera and operetta diva who was the second female in Paris that created Laya in FLEURS D'HAWAII (by the composer Paul Abraham), in which she sang 'Ni toi, ni moi' and a duet with Emile Rousseau called 'La plus belle perle du monde', where, in return, Max Bussy sang to her 'Fleur d'Hawaii'. She also sang Charlotte in Werther, Mignon in Mignon and Suzuki in Madama Butterfly."